Belmont University’s Enactus Team competed against colleges and universities from across the country at this week’s National Exposition and came out in the nation’s top 16 teams. An international non-profit organization that brings together student, academic and business leaders who are committed to using entrepreneurial action to improve the quality of life and standard of living for people in need, Enactus provides opportunities for students to get first hand experience in the world of social enterprise. 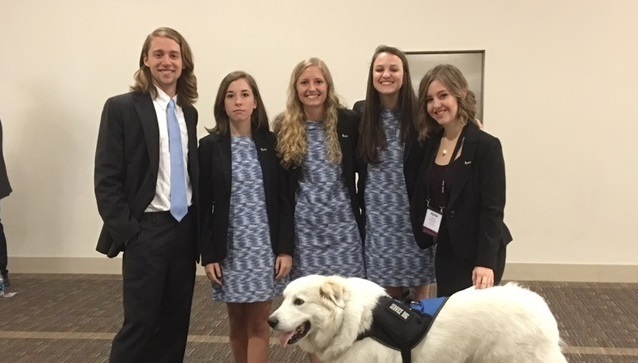 After placing first in their region, Belmont’s team earned the opportunity to travel to Kansas City last week and participate in the national event. This year’s team consisted of 46 members representing a diverse array of majors. Of the team, national competition participants included Rachel Masterson, Audrey Aavik, Lucas Wilson and Olivia Hosey who presented on the projects Belmont’s team has spent the last year working on. Evaluating the projects on their sustainability and scalability, the Enactus model encourages students to formulate projects that will create a social, environmental and economic impact once introduced to the market. But expert business leaders who serve as judges don’t stop there. Students are also expected to speak to the longtime sustainability of their plans, how they can be scaled and whether the impact will last beyond its initial stages. From a social perspective, Enactus’s partner nonprofit provides a workforce development program to employ formally homeless individuals as food cultivators. After graduating from the program (two of which already have since the pilot began), cultivators move on to working in the agriculture industry. Economically, Cul2vate facilitates a financial model that provides 50 percent of the food grown by cultivators to local food banks, while the other 50 percent is sold to the commercial marketplace. Environmentally, because all food finds a home, the project eliminates waste. LawSearchPro, a project created last year to help the Tennessee Association of Legal Services connect with community members in need of legal aid, that is now operating completely independently of Enactus. A greeting card company based in Antigua, Guatemala Greetings provides meaningful employment to women and a wage higher than what is otherwise often attainable. Since its creation, the project has sold more then 400 cards, provided three women with employment earning three times the average wage and added one new retailer to the Antigua community. Sports Officials International, a project originated by the University of Ottawa’s Enactus Team, exists to provide job opportunities as soccer referees to a marginalized group. With Nashville welcoming the largest refugee population in the state, this project relies heavily on partnerships from across the city as Nashvillians are able to find work through sport. HEAL, an international project, is a nonprofit based in Uganda that works to empower vulnerable women and children through teaching sustainability and family preservation. National Enactus competitions are held in 36 countries around the world to showcase how the organization’s students are transforming lives and enabling progress through entrepreneurial action. One team is selected from each national competition to represent their country at the Enactus World Cup, this year in London, England in September. Belmont’s Enactus team previously won the national championship in 2010 and 2012 and claimed the international title at the 2012 Enactus World Cup.